Today we could have been writing a depressing tale about how the Nats bullpen lost a game while allowing a 5 run lead to disappear, and thankfully we are not. Luckily yesterday against the Reds, only a 4-run disappeared, and Jonathan Papelbon saved his own save by working out of a no outs bases loaded situation while clinging to a 1 run lead in the 9th inning to earn his 15th save of 2016 and a much needed 10-9 win in Cincinnati, their first win in Cincy since July 27, 2014. The situations with Papelbon don’t have a great pattern to what is going right and what is going wrong except for his work schedule shows that with 2 days rest between appearances, Pap has been lights out. In his 4 appearances with 2 days rest, Papelbon has had 3 games of 1-2-3 baseball and only has allowed 1 baserunner over those 4 appearances. 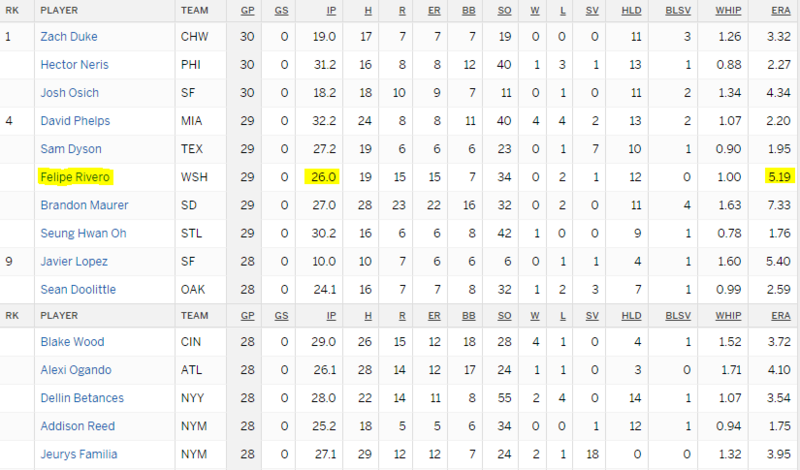 With 1 days rest, Papelbon hasn’t allowed a run either although he has given up some hits. In both instances his K/9 is 9.00 per game. Papelbon’s issues are coming on back-to-back games and games with more than 2 days rest. Maybe “Johnny Jonathan” just can’t pitch in back-to-back games anymore. The fanbase, unfortunately, has all but lost faith in Papelbon. Most believe he no longer has the swing and miss stuff that made him so great in Boston when he was never less than a 9.9 K/9 after his rookie season and was once a 13.0 K/9 for the Red Sox. Papelbon is now at a career low K/9 with the Nationals at 7.1 and it is pitch location and movement that is the problem as his velocity is fine when he is rested. Major League batters can hit 94mph pitches if they lack movement. Maybe the Nats bullpen is showing it’s wear at the back of the bullpen or some bad luck (rain delay) was the root of it or just pitching in hitter’s parks like Citizens Bank Ballpark in Philadelphia and the Great American Ballpark in Cincinnati. 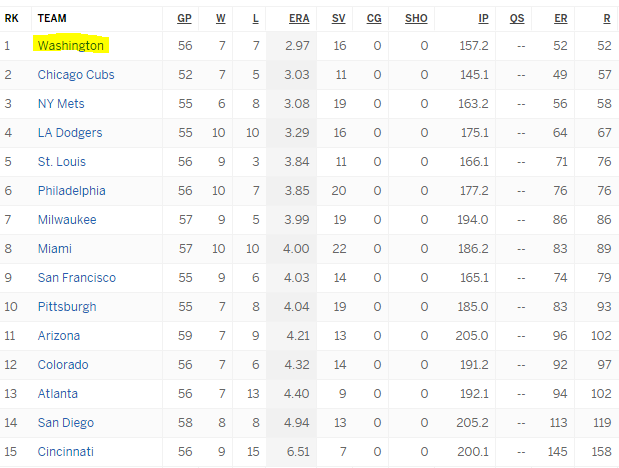 Overall though, the Nationals bullpen is still ranked among the best in baseball. The other issue that cannot be ignored is Felipe Rivero‘s lefty/lefty splits. He actually pitches better to right-handed pitchers and even Dusty Baker became a bit concerned after Rivero worked with a 5 run lead and walked Joey Votto on 4 pitches and then served up a 3-run home run to lefty Jay Bruce. “We got to figure out a way to get Rivero straight against lefthanders because we certainly need him because he has dynamite stuff,” Baker said. With Matt Belisle set to come off of the disabled list, should Felipe Rivero head to Triple-A to work on his approach to lefty batters? Is Felipe just being over-used? The Nationals still have the best bullpen in the Majors statistically and just yesterday the bullpen saw it’s ERA rise from 2.85 to 2.97, and you hope this is bending and not breaking and a function of playing in a tough park for pitchers as the ball was flying all weekend. In this cliche talk of ‘it ain’t broke don’t fix it’ the bullpen talk is getting a lot of chatter, and it should because it is vulnerable. Here are 1/2 dozen names to ponder: Andrew Miller, Ryan Buchter, Alex Colome, Tyler Thornburg, Daniel Hudson and Sean Doolittle. These are all names we believe can be made available and the time to pounce will be sooner than later. In the meantime, the Nats already have the man who could close in place of Paplebon and his name is Shawn Kelley. Using Sabermetrics, Kelley is the 15th best back of the bullpen reliever in the Majors, and would be looking even better if he wasn’t victimized on Saturday by the rain-delay dilemma. Sometimes the answer is just sitting under your nose. This entry was posted in Analysis, Bullpen, Felipe, Papelbon, Roster. Bookmark the permalink.